Prefabricated homes can be incredibly cost-efficient, which means there might just be enough room in the budget to indulge in the big family home of your dreams. The project we’ll explore today could even prove to be the perfect match. 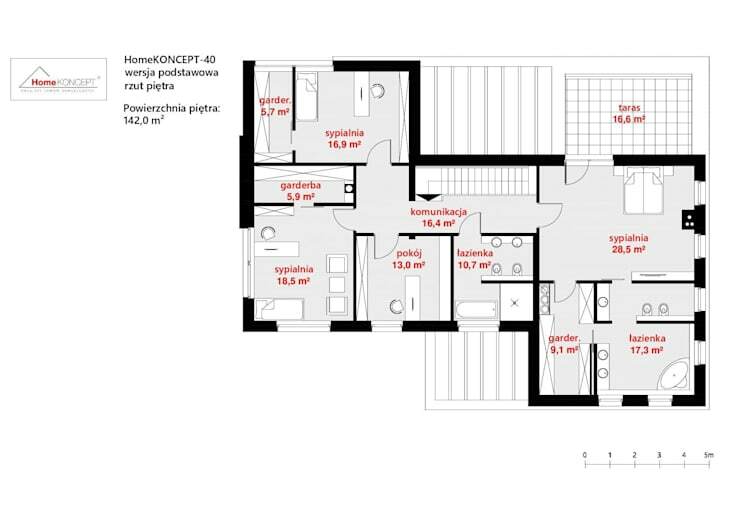 It’s the largest version of the Domu 40 design offered by Polish architects Homekoncept and covers an expensive 255sqm, with an additional space of 40.93sqm for the garage. It has five bedrooms, three bathrooms, a garage for two and huge entertaining area. But, as with many prefabricated homes, it’s always possible to order a more modest version of this home if needed. The home has a natural slate stone façade. The dark shades of the stone give the exterior a contemporary appearance, while the subtle textures of the natural material, together with the wooden walls of the garage create a sense of harmony with the surroundings. One of the most appealing elements here though is the thick white beam that wrap around the garage and snakes around the perimeter of the home. The home has quite large minimalist style windows on all sides. They allow a huge amount of light to enter the home, giving it that classic breezy ambiance that’s so popular in modern homes. The lack of internal frames also puts this home quite firmly into a modern framework. The expansive outdoor entertaining area is connected to a guest bedroom or pool house area. It has its’ own bathroom and can function as an entirely separate residence if needed. This kind of design would be perfect for those looking for a place to house extended family or frequent guests. Note how the broad white beam connects this area to the main dwelling. A big family home really needs a good terrace or outdoor entertaining area so children can burn off a little extra energy and engage in some healthy outdoor activities. Ideally, the entertaining area should be conceived at the same time as the main dwelling so as to create a good integration between indoor and outdoor spaces. In this home design, the large windows provide a natural starting point for this integration. All the sociable areas of the home are located on the ground floor. Here we find a spacious living room separated from the dining room by a centrally located fireplace and a comfortable kitchen. This area looks out onto the pool area and terrace. As mentioned earlier, the outdoor area also has a guest bedroom with its own small bathroom. There are also extra amenities such as a laundry, dressing room and a walk-in pantry. The first floor contains the more private areas. Here we have the master bedroom complete with an ensuite bathroom and dressing room. There are also three children’s bedrooms with direct access to a communal bathroom. Although the entire home receives a profuse amount of light, it’s actually quite energy efficient. The base is made from reinforced concrete, the windows are all heavily glazed and there is even the option of installing under ground heating. 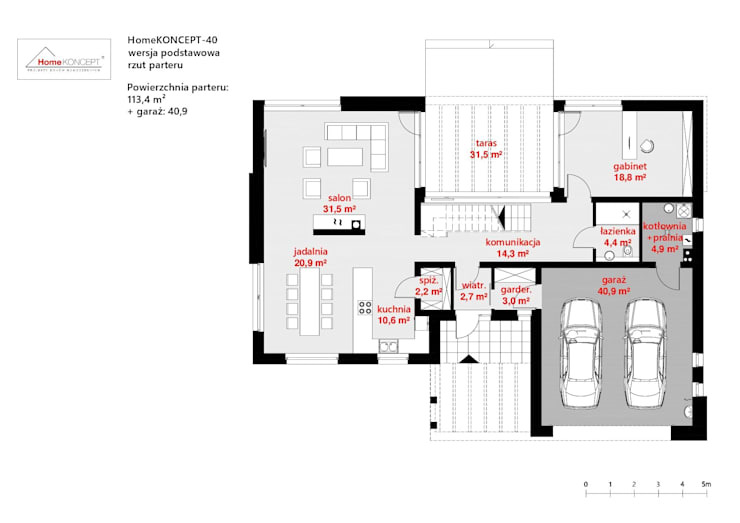 We have loads more architectural projects to explore, so have a look at A cleverly designed family home—with floor plans included. What's your favourite aspect of this home?